Still images looped into video show Omar's rapid intensification to a Category 4 storm. 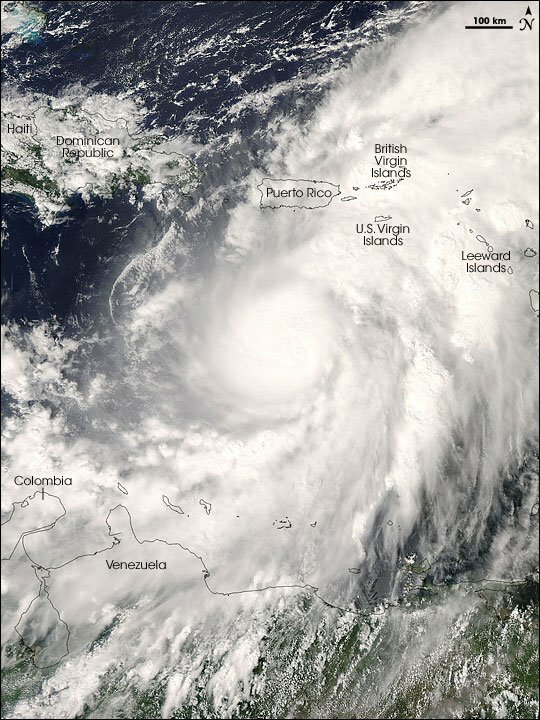 Hurricane Omar in 2008 ripped through the eastern Caribbean with winds up to 135 miles per hour, causing death and extensive damage. Images courtesy of the National Oceanic and Atmospheric Administration. Results: When hurricanes blow over ocean regions swamped with fresh water, the storm can unexpectedly intensify. According to a new study led by researchers at Pacific Northwest National Laboratory and published in the Proceedings of the National Academy of Sciences Early Edition, though the probability that hurricanes will hit these conditions is small—about 10 to 23 percent—the rate at which they intensify can be relatively higher when they do, by as much as 50 percent on average. "Sixty percent of the world's population lives in areas affected by tropical cyclones," said Dr. Karthik Balaguru, lead author of the study and oceanographer at PNNL. "Cyclone Nargis killed more than one hundred and thirty eight thousand people in Burma in 2008. We can predict the paths cyclones take, but we need to predict their intensity better to protect people susceptible to their destructive power." 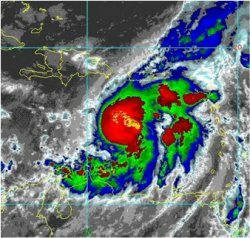 Why It Matters: Satellites are useful for tracking and helping to predict the path of tropical storms as they move across the ocean and develop into cyclones or hurricanes, as well as predicting where the storms will hit land. But current technology isn't as good at predicting how intense the storm will be when it does hit land. This study provides new insight into the conditions that make these storms, which affect millions of lives around the world, more intense and destructive. "A 50 percent increase in intensity can result in a much larger amount of destruction and death," said Balaguru. Methods: Balaguru and the research team looked at Omar, a Category 4 hurricane over the eastern Caribbean Sea in 2008. They found that regions of the ocean where there is a large influx of fresh water sets up conditions that form a layer between the surface and the colder ocean below, termed a barrier layer, preventing typical ocean mixing and cooling of the surface layer by strong winds. The most intense activity of Omar occurred when the storm traveled over this thick layer. Balaguru and colleagues then examined 587 tropical storms and cyclones between 1998 and 2007 in the western tropical Atlantic, the western Pacific and the northern Indian Oceans. They found that when tropical storms passed over thick ocean barrier layers, the storm cooled off 36 percent less than storms passing over areas lacking barrier layers, and barrier layer storms drew 7 percent more heat from the ocean than other storms. The team supported their analysis with a computer model, comparing tropical cyclones over regions with and without barrier layers. What's Next? Researchers have shown how the barrier layer affects hurricanes now. Future research topics may explore how the distribution of ocean barrier layers around the world may affect storms in a warmer world. For more information, see the PNNL News Center, "Fresh water breathes fresh life into hurricanes"
Acknowledgments: This research was supported at PNNL by the U.S. Department of Energy (DOE) Office of Science, the Biological and Environmental Research (BER) Integrated Assessment of Global Change program for the Regional Integrated Assessment Modeling project and the BER Regional and Global Climate Modeling program for a collaborative project between PNNL and Texas A&M University. Additional support was provided to Texas A&M by the DOE BER's Regional & Global Climate Change program, the U.S. National Science Foundation, the National Science Foundation of China, and the Chinese Ministry of Education. The work was performed by Drs. Karthik Balaguru and L. Ruby Leung of PNNL; Drs. Ping Chang, R. Saravanan and Jen-Shan Hsieh at Texas A&M; Zhao Xu at Texas A&M; and Dr. Mingkui Li at Ocean University of China. Reference: Balaguru K, P Chang, R Saravanan, LR Leung, Z Xu, M Li and JS Hsieh. 2012. "Ocean Barrier Layers' Effect on Tropical Cyclone Intensification." Proceedings of the National Academy of Sciences of the United States of America 109(36):14343-14347. DOI:10.1073/pnas.1201364109.